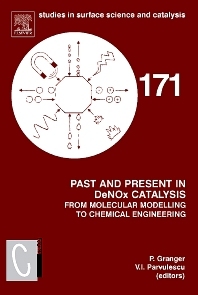 This book offers an overview of the state of the art in the field of DeNOx catalysis in order to focus novel orientations, new technological developments, from laboratory to industrial scale. A particular attention has been paid towards the implementation of catalytic processes for minimising NOx emissions either from stationary or mobile sources under lean condition to meet future standard regulations of NOx emissions. In the first part of this book, critical aspects reported in the literature which usually make difficult the achievement of efficient catalytic technologies in those conditions are summarised and analysed in order two separate new perspectives. The second part deals with fundamental aspects at molecular level. A better understanding of the reactions involved under unsteady-state conditions is probably a pre-requisite step for improving the performances of the actual processes or developing original ones. The development of powerful in situ spectroscopic techniques is of fundamental interest for kinetic modelling. Correlations between spectroscopic and kinetic data with those obtained from theoretical calculations are reported. Some illustrations emphasise the fact that these comparisons may help in determining the nature of the catalytic active sites and building predictive tools for simulations under running conditions. The latter part of this book will be illustrated by different practical approaches covering various aspects related to the catalysts preparation and the development of alternative technologies which include industrial considerations.